Sometimes stellar food arrives on wheels. 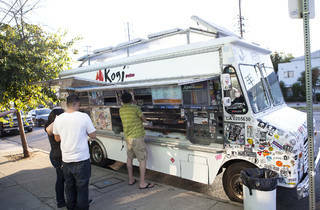 Check out our guide to L.A.’s best food trucks for a solid meal on the go. In a city as sprawling as Los Angeles, food trucks offer a vital, roaming oasis for hungry travelers in search of a quick bite or late-night snack. From tacos to pizza, hot dogs to grilled cheese, there are plenty of excellent options when it comes to grabbing a bite on the go. We’ve rounded up our favorite food trucks across the city to help you navigate the choices. And if you’re looking for more movable feasts, check out Roaming Hunger for the latest food truck options and news. 16 fantastic food trucks in L.A.
One of the long-standing heroes of the old-school taco trucks—aka loncheros—Mariscos Jalisco has earned a deservedly loyal and devoted following. Their signature tacos dorado de camaron live up to the hype, with flavorful and fresh shrimp folded into a corn tortilla that’s then fried to a golden brown and topped with thick slices of avocado and a vibrant and complex salsa roja. You’ll also want to save room for their legendary tostadas, like the Poseidon, which is topped with shrimp ceviche, octopus and a fiery red aguachile of shrimp. Food truck or no, these guys make some of the best tacos in the city, vastly outpacing most of L.A.’s brick-and-mortars. Follow them on Twitter and don’t forget to bring cash. 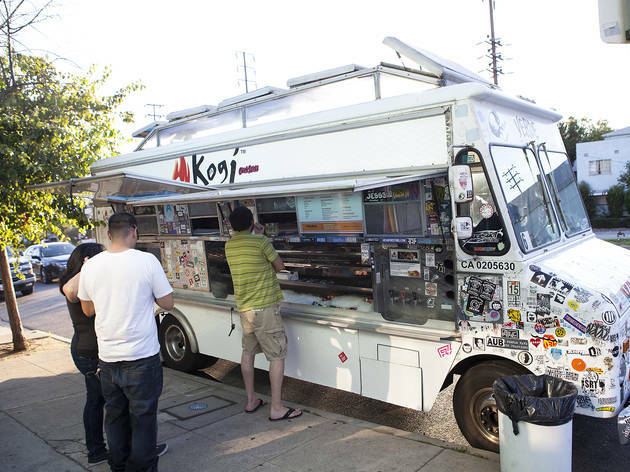 The grandaddy of the modern food truck bonanza since 2008, Roy Choi’s Kogi empire still rules the streets with a delectable mashup of Korean and Mexican flavors. The signature short rib taco delivers big with double-caramelized Korean BBQ depth that’s balanced with a bright spike of salsa roja, a chile-soy slaw, cilantro and onions on two grilled-and-charred house tortillas. The now-classic kimchi quesadilla is still a winner, but the blackjack quesadilla with spicy pork, caramelized onions and salsa verde is also a solid choice. And if you’re looking to skip the meat, you can always swap in tofu as a filling. There are three trucks to track down (known as Roja, Verde and Naranja) in multiple locations daily; check the schedule online and find them on Twitter. You can also hit up their brick-and-mortar taqueria in Palms, and their Whole Foods outpost in El Segundo. A few years in and L.A.’s first bagel truck still draws big pre-noon crowds for their quality, hand-rolled bagels served up with plenty of schmear and swagger. Available in plain, poppy, sesame, everything and addictive cheddar, the Yeastie Boys’ bagels offer that sought-after delicate balance of fluffy center and thin crust. Particularly after a late night, the Game Over scores with soft scrambled eggs, peppery bacon, beer cheese, tomato and jalapeño spread. Meanwhile, the Lox features smoked salmon and dill spread, radishes, cucumber and caper pesto. You can follow them on Instagram and Twitter for locations and specials to be had at their two trucks. This handmade-pasta truck’s got places to go and people to see—namely the streets of Los Angeles and Santa Monica, and it’s got to see the hungry throngs that line up for its little tubs of gourmet Italian noodles. You can also find the prince’s fresh pasta for sale in 8-ounce bags—and yes, there is really an Italian prince involved. To find Prince Emanuele Filiberto di Savoi’s roaming pasta truck, follow along on Instagram or check the site daily. There’s something about eating BBQ outside that seems to enhance the experience, and that goes double for this truck serving excellent Southern classics. Run by Georgia-born chef Ryan “Peaches” Lamon, the truck serves up a succulent, 15-hour-applewood-smoked pulled pork sandwich with a tangy BBQ sauce and creamy slaw on a Portuguese sweet bun. Other hits include the buttermilk fried chicken sandwich and the country-fried steak sandwich with house peach preserves and garlic aioli. For a non-meat option, the veggie melt—made with pimento cheese—is a solid choice, and you’ll definitely want to share the waffle fries. The schedule and locations change frequently, so check Twitter for updates. While there are certain trucks around town that we rely upon for knockout renditions of one particular type of taco—Leo’s, we’re looking at your al pastor—El Chato manages to deliver excellent options across the board (or plancha, rather). And since their small, palm-sized tacos run for $1.25 each, you can easily sample your way through the menu without breaking the bank. Favorites include the diced carne asada, al pastor, chorizo and lengua, all of which are treated to a healthy splash of their smoky roasted salsa roja, cilantro and onions. If you’re looking for a more hefty option, the quesadilla is a solid choice and still perfect for those on a budget. They’re not too active on Twitter, but you can always find updates on their Facebook page. Just be sure to bring cash and be ready for the inevitable line. Just as you chased down the ice cream truck as a kid, the architecturally-inspired ice cream sandwiches from Coolhaus are worthy of the pursuit. And while they can now be found across the country (and in a few brick-and-mortar locations), we still hold their sweet treats on wheels near and dear. The sky’s the limit when it comes to pairing their creative ice cream flavors with freshly-baked chewy cookies, but we’re partial to balsamic fig and marscarpone with double chocolate cookies. Keep an eye out for seasonally-rotating options, and don’t worry if you get carried away chowing down—the wrappers are edible. Keep an eye on Coolhaus’ schedule for special events and locations. There are a handful of lobster trucks roaming the streets of L.A., but Cousins Maine Lobster is at the top of the fleet. The company, which got its start by winning over an investor on Shark Tank, has grown to include multiple trucks that cross town, slinging lobster in various forms (tacos, tots, tails) but ultimately nailing two forms of lobster rolls: Connecticut and Maine. Both served on a New England-style roll, the Connecticut is warm and topped with butter, while the Maine is served chilled with a touch of mayo. Pair either with Cape Cod chips and settle down for a true taste of New England. Can’t wait to get your hands on some? Check the site for locations daily, or visit their first brick-and-mortar restaurant—which happens to be located here in L.A.—at 8593 Santa Monica Blvd. Spice up your life with these trucks’ authentic Indian street foods, and especially the frankies: egg-washed roti stuffed with succulent meats, paneer, house-made sauces, slaws and hot chutneys. Think of them as the best wrap you’ve never had. There are taco chaats—where crispy blue-corn tortillas meet lamb, chicken, beef or potato—and butter chicken curries and garlic naan and even combos, so that you can try a little of everything. These guys tend to stay on the Westside and South Bay, and you can track their progress through these neighborhoods and others via Twitter. What began as a contender at L.A.’s Grilled Cheese Invitational has since grown to an armada of trucks doling out cheesy, melty goodness across the nation. But the Grilled Cheese Truck still maintains a strong hold on the hearts (and stomachs) of Angelenos looking for a comfort-food fix. While you could keep things simple with a straightforward cheese-and-bread combo, if you really want to indulge, the Cheese Mac ’n’ Rib—aka "#FullyLoaded"—option hits you with sharp cheddar, caramelized onions, smoked BBQ pork and a dose of mac and cheese. You’ll likely want to grab some tater tots and a cup of tomato soup if it’s not a scorchingly sunny day. Check their calendar and Twitter to find one of their four roving trucks. Looking for a great burger? 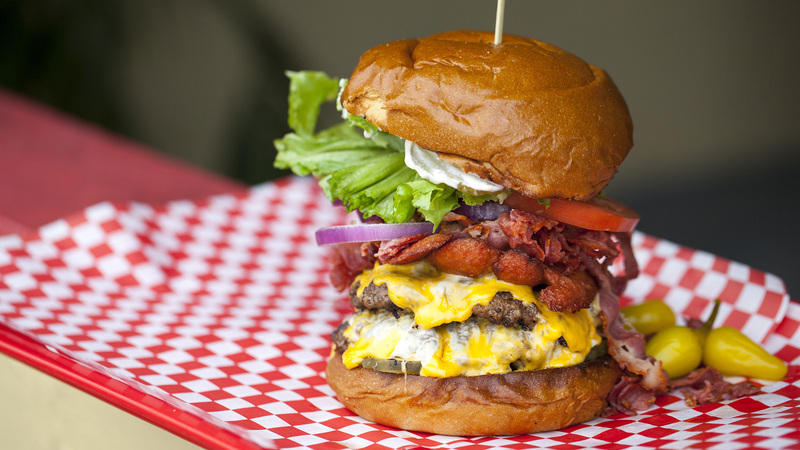 The best burger restaurants in L.A. 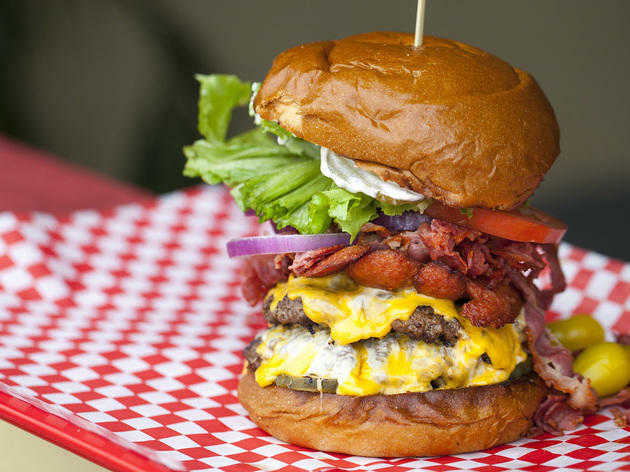 Score a great burger at one of these spots.